‘Tis the season to spread a little magic! If you’ve ever read J.R.R. Tolkien’s The Father Christmas Letters, you know what a gem they are. Full of beautiful illustrations and humorous stories, the letters Tolkien wrote to his children from Father Christmas spanned 20 years from 1920 to 1942. Those letters inspired me to pick up Santa’s pen when my children were growing up and, years later, to continue the tradition with letters to my neighbor’s children, now ages nine and seven. I often do a little research on the North Pole to put me in the right frame of mind before writing. A photo of colorful fur boots from Lapland caught my eye this year and sparked the story. Wishing you a wonder-filled holiday and the chance to spread some magic of your own! 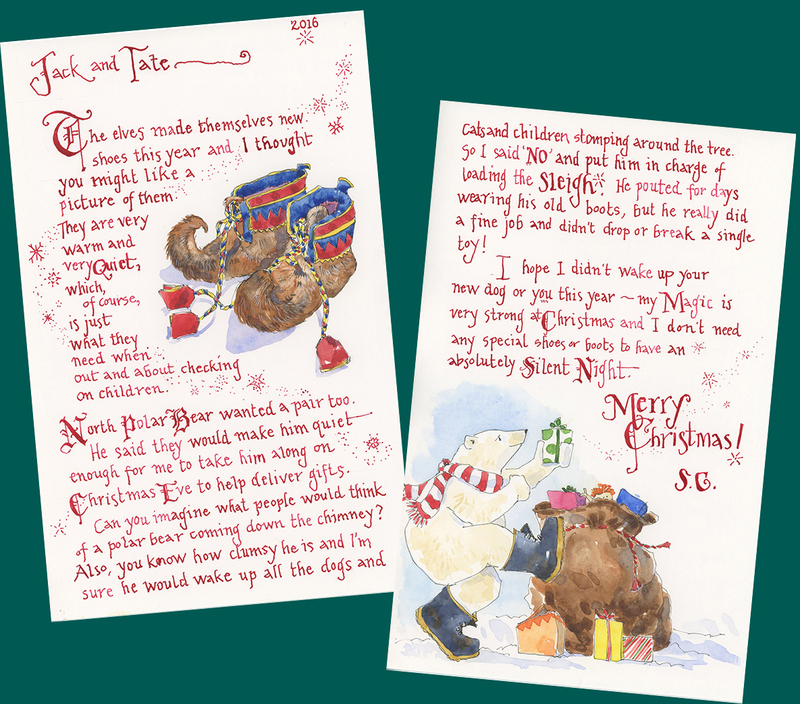 This entry was posted in Watercolor and tagged hand lettering, ink, letter from Santa, winter by Jean Mackay / Drawn In. Bookmark the permalink. So nice pictures and the story! Thanks Irina- happy to share it a little more widely! The Christmas letter is absolutely beautiful! Thank you! Always a fun thing to do! Glad you enjoyed it! Beautiful wishes Jean. Hope you have a wonderful holiday season. Thanks Shari– Likewise! I continue to enjoy and learn a lot from your blog– keep sharing! I’m eager to get back to my journal after several weeks of other art projects. Happy Holidays! Wow. I am humbled. I, too, have written Santa letters in the past, but your letters and drawings are beautiful to behold! I am inspired, for sure. Thanks Marilyn! I love getting out that red ink once a year. Love this! And all of your posts. Joy to you and yours this holiday! Thank you Tori– so nice of you to say. I appreciate it! Have a Merry Christmas! All the letters are very inspiring. and happy to learn about it. Jean, these are wonderful. The Professor would be proud. Makes me wonder if more people around the world are carrying on Tolkien’s letter tradition. Wouldn’t it be fun to collect them all in a book? Thanks! That would be fun…except that we would all pale in comparison. Might be better to just reread Tolkien. That is so enchanting. Lucky, lucky neighbor boys. Beautiful as always! Just seeing the cards, it totally reminded me of Tolkien’s Christmas letters. Wish you a Merry Christmas!! Great to hear! I’m glad you have enjoyed Tolkien’s letters too! Dear Jean, thanks for keeping the magic alive for all of us! That is awesome Jean, I wish you and your family a very Merry Christmas! There is definitely something unique about letters, it makes the holidays come alive! Great Story, Jean along with the sketches. I’ll have to read Tolkien’s stories Many magical and creative days with your painting during 2017. Note: I missed a few of your previous blog posts; I had accidentally deleted “following” of your blog. Thank you! I didn’t post this year’s letter, but I was glad that the youngsters who I write it for are still believers.